For Guy Whittingham, Moneyfields was home. Then it was Emsworth, next Cosham – and not forgetting Purbrook or Havant. ‘Have boots, will travel’ was the policy when it came to training with Pompey when Corporal Punishment was nothing more than a private. Back in 1989 it was a case of changing at Fratton Park, hopping into a car and heading to Moneyfields FC’s Dover Road ground for use of their pitches and multi-gym. For a then-division two side, it was certainly nothing out of the ordinary. Now Whittingham has been charged with finding a new training venue to move into next month, with the Blues having served noticed to quit the Wellington Sports Ground in Eastleigh after 11 years. Fratton Park has been earmarked to serve as the base, with plans under way to accommodate a gym and offices as current facilities are transferred. Pompey’s players will also be able to change at the ground, solving that particular dilemma. 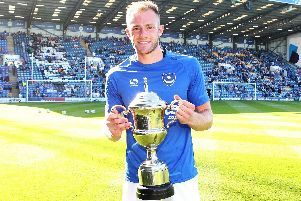 It leaves the caretaker boss to unearth suitable training pitches, having already been rebuffed in an attempt to relocate to the University of Portsmouth’s Langstone Campus. For Whittingham, it is a back-to-basics approach he knows only too well. He said: ‘Since I first joined in 1989 and a few years before that, it has always been mooted we were going to go somewhere else permanent to train, but never did. ‘There was no gym. We used to change at Fratton Park, get in our cars and go to Moneyfields to train. ‘There was a small multi-gym and there were two pitches. That was it. ‘That wasn’t the only place we trained at. There was the old IBM in Emsworth, up in Cosham, Purbrook and a school in Havant. ‘You were used to it then. As a player I think you get on with it – and we were playing in effectively the Championship. The good old days. ‘Now we are just looking for the best facilities we can find in and around Portsmouth. ‘But it’s not as if we are going to Fratton Park, getting changed there, then finding a pitch every day and end up at the local rec. ‘We will be organised and there is a reshuffle at Fratton Park which is going to allow us to take our gym, analysis department and offices down so it will be professionally done. ‘It might be a case of finding somewhere else that’s not too long a drive away and you go to train and come back. The gym, in particular, is a key part of the modern footballer’s regime. And it is an issue Whittingham feels can be solved by relocating to Fratton Park. He added: ‘Modern footballers, even at League One and League Two clubs, have access to gyms and they are usually pretty close by. ‘There’s a lot of stuff you do in the gym before and after training for strength and conditioning and that is why it is imperative you have a gymnasium close.